Eating any carb-containing foods can cause an elevation in your blood sugar levels, but some carbs will raise your blood sugar levels more than others. The glycemic index, or GI, is used to categorize carbs according to how they influence your blood sugars. Eating low glycemic foods, with a GI value of 55 or below, results in a small and steady rise in your blood sugar levels, while eating high glycemic foods, with a GI of 70 and above, results in a sharp rise. Foods with a medium GI of 56 to 69 have an effect in between low GI and high GI foods. Choosing low-glycemic-index carbs over high-glycemic carbs is a good way to optimize your health by keeping your blood sugar levels more even throughout the day. A diet based on low glycemic carbs is associated with a healthier body weight, higher energy levels, enhanced athletic performance and a decreased risk of developing cardiovascular disease, type 2 diabetes and some types of cancers. Low glycemic foods include sourdough bread, steel-cut oats, barley, quinoa, whole grain pasta, sweet potatoes, plain yogurt and most fruits. High glycemic index foods, such as white bread, most breakfast cereals, potatoes, white rice and baked goods, should be avoided to keep your GI low. 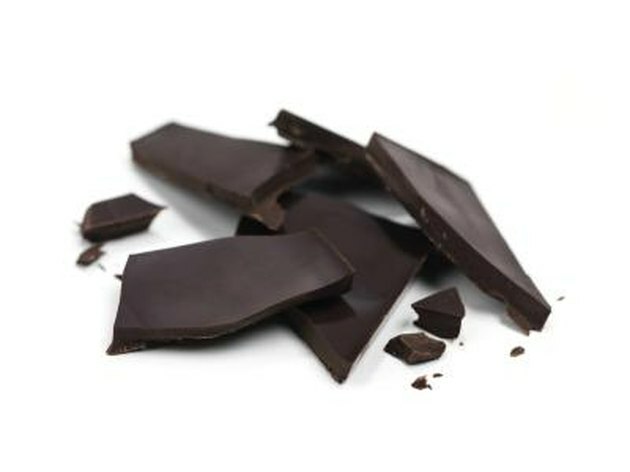 Dark chocolate has a GI of 23, according to the University of Sydney GI Database. These GI values fall in the very low glycemic index category, which means eating dark chocolate won't make your blood sugar levels peak, then crash a few hours later. Rather, dark chocolate -- chocolate with a cocoa content of 70 percent or higher -- will help you stabilize your blood sugar levels if eaten as part of a low glycemic index diet. Regular milk chocolate has a slightly higher glycemic index, with values ranging between 34 and 49, which also falls in the low-glycemic index category. The low glycemic index of chocolate, whether it is dark or milk chocolate, is mainly due to its high fat content, which delays gastric emptying and therefore slows down the digestion and absorption of the sugar it contains. Although milk chocolate also has a low GI, it contains a lot more added sugar compared with dark chocolate, and the latter is a healthier treat for your low glycemic index diet. If you want to satisfy your sweet tooth while keeping your sugar intake low and following your low glycemic index, or GI, diet, dark chocolate makes a perfect finale to your meal. You can simply have two to three squares of chocolate, but for a change, you can also dip strawberries in melted dark chocolate or have a dark chocolate fondue with fruits. Most fruits, such as berries, cherries, apples, pears and oranges, have a low glycemic index. You can also melt some dark chocolate and mix it with ricotta cheese or unsalted cottage cheese. Blend until smooth in a blender and enjoy as a healthy low-sugar, high-protein and low GI dark chocolate mousse. You can also use this mousse as a dip for fresh fruits.